If your pipsqueak channels Pollock to ‘decorate’ the walls in your home, set her up for success with Wee Gallery‘s new Dress-Me wallpaper. Featuring the same adorable and endearing bunnies, foxes and pigs from the company’s popular activity books, this wallpaper is designed to be drawn on. Dress-Me wallpaper is fully removable, and it’s printed in the USA on durable, PVC-free, self-adhesive paper. All you need to do to outfit your wall is soak the paper in water, then apply. Kids and adults alike will enjoy unlocking the artist within by dressing-up the sweet creatures in an array of colorful ensembles. A soothing and relaxing unplugged activity that doubles as unique decor! If your pipsqueak channels Pollock to 'decorate' the walls in your home, set her up for success with Wee Gallery's new Dress-Me wallpaper. Featuring the same adorable and endearing bunnies, foxes and pigs from the company's popular activity books, this wallpaper is designed to be drawn on. 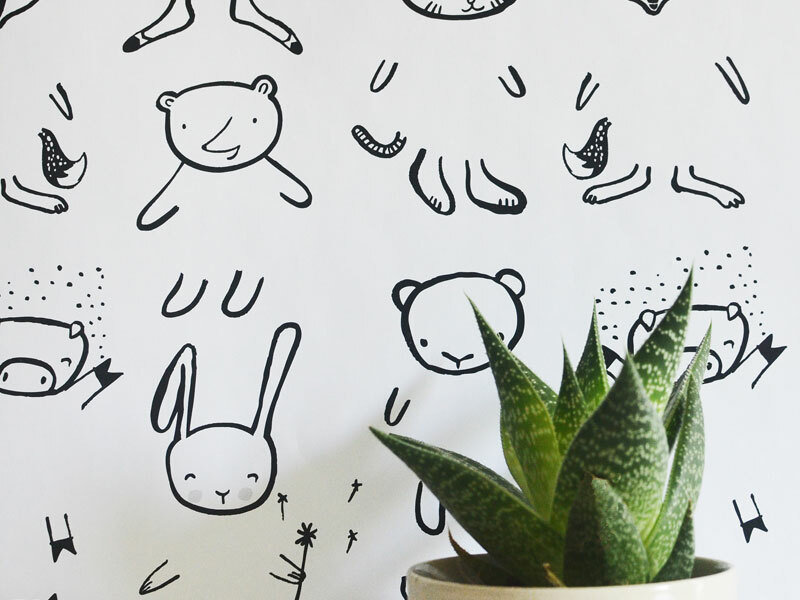 Dress-Me wallpaper is fully removable, and it's printed in the USA on durable, PVC-free, self-adhesive paper. All you need to do to outfit your wall is soak the paper in water, then apply. Kids and adults alike will enjoy unlocking the artist within by dressing-up the sweet creatures in an array of colorful ensembles. A soothing and relaxing unplugged activity that doubles as unique decor!